Surprisingly, a search of the Oka Owners Group forum revealed only five references to fitment of airbags to an Oka, (and one of those was mine), plus an article by Peter Furlong from several years ago. I'm aware of at least 6 Oka's with airbags fitted but I'm sure many other people are toying with the idea. In the May 2011 issue of the CMCA magazine The Wanderer is an article by Collyn Rivers on "Airbag Characteristics" which makes interesting reading. In an earlier article (Feb 2011) he cautioned that airbags should never be fitted only to either the front or rear of a towing vehicle, citing potential jack-knifing of caravans. (Note you may need to be a CMCA member to access articles from The Wanderer). Having recently fitted airbags to both the front and rear of our Oka, I was somewhat relieved to read Collyn's conclusion that "there is no reason at all not to use air bags if you wish. They are first rate engineering products, but specifying them correctly requires considerable skill and expertise". In the latest article he explains in more detail implications of adding airbags to a suspension system. He also refers readers to an article on his website (Vehicle Dynamics) which discusses generally how a vehicle behaves on the road. Although much of the emphasis relates to towing and caravan applications these articles are worth reading before embarking on any changes to an Oka suspension. since we live in the Oka while traveling, being able to level the vehicle at night was an additional side benefit. Fitting airbags to the rear suspension in 2010 was easier than the front and I'm glad I tackled that end first. On a 14,000 km trip up to the Tip of Cape York they performed well, allowing load levelling and raising the rear as necessary. 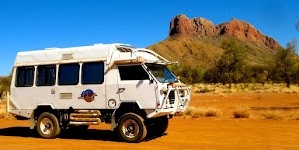 Passengers in the rear reported a very smooth ride even over quite severe corrugations. It was a very different story in the front however, sitting directly over the wheels, with quite stiff front springs and heavy duty (Ralph) shock absorbers, the ride was shattering over any significant corrugations, and it was that which lead us to install airbags on the front this year, in an attempt to provide a smoother ride as well as the other levelling capabilities. Individual airbag pneumatic controls is required to get the most benefit from these functions. I did as much research as is practical into airbag selection (also called air springs) and reviewed other people's installations. The model we fitted is that recommended for the Oka by the Firestone Airbag importer, The Airbag Man, their part number AB0051. This is a Firestone model 1T14C-1, which defines a family of reversible sleeve air springs. The Firestone Assembly Order Number is W01-358-5311, which defines the specific characteristics of this variant (and there are hundreds of variants). This is also the number to use for an internet search. The metric datasheet can be found here and the imperial version here. A brief explanation of how an air spring works is here and a full Engineering Design Guide can be found here. There are other manufacturers of airbags, notable Goodyear, but most applications seem to use Firestone. For some insight on airbag failure modes see this Goodyear document and scroll down to page 168. Over-extension, chemicals, corrosion, impact and abrasion are the most common causes of failure (can there be many others?). This site shows the failure modes for airbags fitted to a Range Rover. Driver side front airbag fitted. This was the trickiest due to the studs on the diff housing. The W01-358-5311 model has an internal buffer, so it can be used to replace the standard Oka Aeon rubber bump stops, (although in normal operation the internal buffer would hardly get used so it's prime function would be to protect the airbag from damage though over-compression) and has a design height of 255-260 mm which is just what an Oka needs (roughly the space between the top of spring and the chassis bump stop mount). This model can be used from about 160 mm to 320mm operating height but at 260 mm, it's in the design centre of both it's height range and air pressure range of about 3 to 5 Bar (40-60psi), which is load dependent. In a very simplistic calculation to verify this assumption, for an Oka at 5500kg, each spring carries roughly 1000-1200kg (allowing for the unsprung axle/spring/wheel weight), with probably more at the rear than the front. To support half this load requires the airbag to support about 500-600kg at it's normal operating height. From the Firestone datasheet, at this load and 260mm height, the internal air pressure required is around 3-4 Bar (40-50 psi) which is in the centre of its operating range of .7 to 7 Bar (10-100 PSI). Collyn Rivers in his article notes that the best airbag operation (soft ride with impact absorption) is over the lower 40% or so of it's pressure range, so on that basis we are about right. Note of caution: at maximum pressure and/or operating height, these airbags could spread the spring/chassis separation distance to a point which might over-extend the length of a shock absorber. This could lead to a mechanical failure somewhere. It's unlikely to occur in practice if the vehicle height is kept within normal bounds but I suggest keeping airbag pressures down to 20-30 psi when the Oka is lightly loaded (eg between trips) to avoid this. Taking weight off an airbag quickly allows it's height to increase unless the air pressure is also reduced (Boyles Law). You can buy these airbags from The Airbag Man, or their distributors (eg Air Springs SA , which is what we did for the first 2), or from any number of US on-line stores eg TruckSpring.com (which where went for the last 2 at a considerable saving (more than 50%, even after the addition of freight) or SDTruckSprings. Genuine Firestone pneumatic controls and gauges are also available from the same US suppliers but we found a local supplier Air Ride Suspension in Sydney who was almost as competitive, so we supported them. They can also supply the air pipe and push-fit connectors (which are very quick and effective). A dual pneumatic control panel. Two are needed for individual control of 4 airbags. There are individual air switches and a dual needle pressure gauge (white and yellow needles). Fitting airbags is not a trivial task as it requires a fair amount of steel fabrication and assembly, to design and manufacture the top and bottom plates to support the airbags and to meet the physical peculiarities of the Oka, and to align and attach them securely to the springs and chassis. 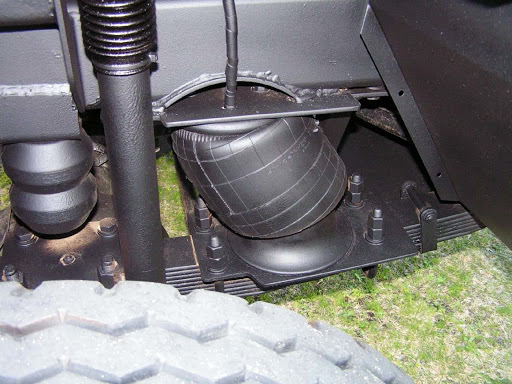 For a tough, off road vehicle, this certainly requires a lot more than "just bolt the top and bottom plates on" concept shown in the Firestone installation video. Neither is it a cheap exercise, an airbag will cost from $200-400 each, depending on the source (US/Aust), and a dual control panels are $150-200 each, so the total for 4 airbags with individual controls is around $1500. It is possible to pay more, by fitting an all-electric system of electrically controlled valves for each airbag. This allows the system to be controlled by electrical, rather than pneumatic switches, or an automated electronic levelling system, like a Winnebago. Much useful practical experience was gained from David Hallandal's airbag installation, and I appreciate his help and assistance with this, and I also located several web photos of other installations to analyse. Top and bottom steel plates must be mounted to the Oka to provide flat platforms for the airbag to operate between, and be attached to. 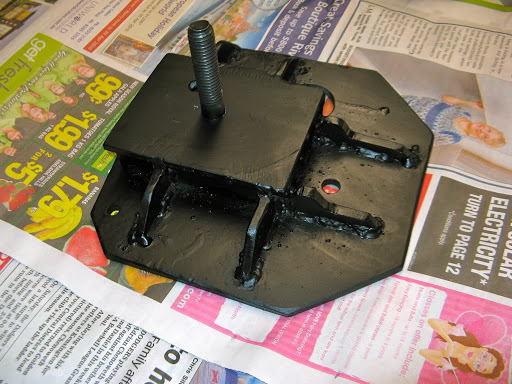 The top plate is attached to the chassis via the bump stop bracket after the Aeon rubber buffer has been removed. The bottom plate is attached to the spring clamp. Fitting the rear airbags is the least challenging and there are several ways of supporting the top and bottom plates. 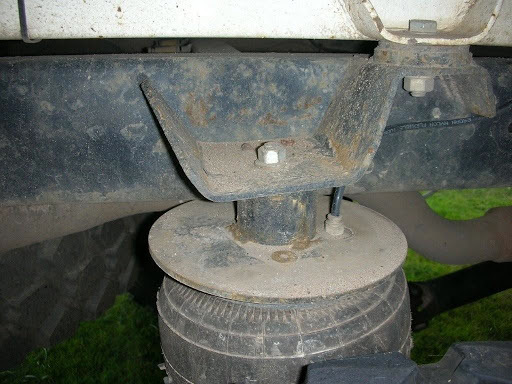 Apart from ensuring reasonable alignment of the top and bottom plates (and Firestone claim that they are quite tolerant to misalignment of up to an inch either way), the challenge is primarily the design of the mountings so that they can actually be assembled on the vehicle. The airbag piston (the large aluminium casting supporting the rubber bag) is sandwiched between the airbag and bottom plate by a single centre bolt into the airbag. This is fitted up from underneath the bottom plate and needs to be a countersunk head bolt since it will be located on top of the spring clamp. The piston has no fixings of its own. The fixings for the top of the airbag comprise 2 captive tapped holes and an air inlet hole. 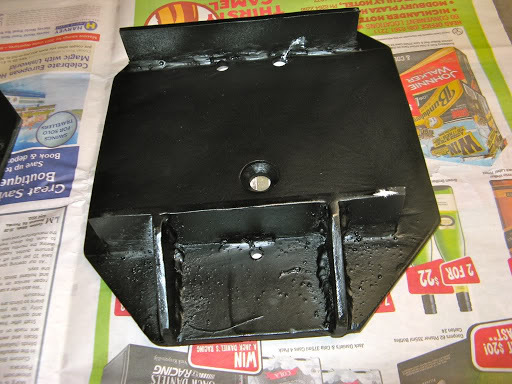 The top plate needs to be designed so that the bolt holes are accessible for insertion of the bolts when the top plate itself is fitted to the bump stop bracket, while allowing the air inlet connection to be accessible for connection of the air pipe. A 25mm spacer is also required so that the top plate clears the chassis frame, and a countersunk bolt is needed to fix the top plate to the bump stop bracket since its head will be located directly above the airbag. Here are a few Installation Techtips transcribed from the Firestone Web site. Click on the headings to go to the Firestone website. 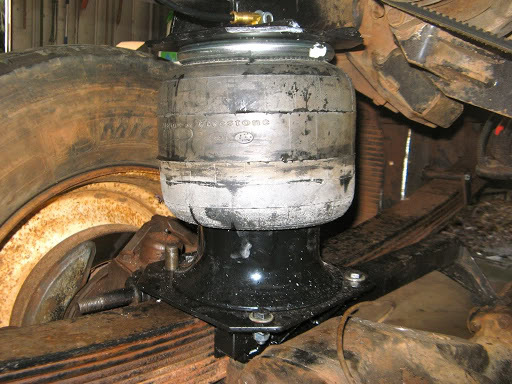 Here are a few quick tips to make the installation of your air helper springs and air accessories correct and ensure proper operation of your system. 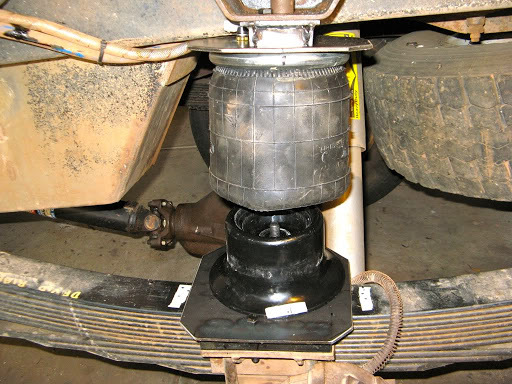 Air Spring alignment is important to the operation of your air helper spring kit. Upon installation, visually align the air spring. There is no need to use a level or other measuring device because the air springs are very forgiving, if it's off a fraction you should be fine. Most kits allow for movement of the upper and lower brackets to assist in making the air spring vertical. Position the brackets so the upper and lower brackets are parallel. 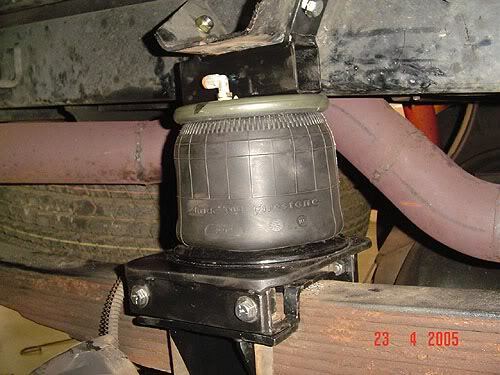 The most important item to consider when placing the air spring is design height. As long as the proper design height is maintained and the air spring is as vertical as possible your kit will provide you with years of service. Firestone's push-to-connect fittings are extremely easy to use. Once the length of air line has been selected to span the distance from the air springs to the inflation valves simply use a sharp knife to cut the air line as square as possible (DO NOT use hand cutters or other devices that may deform the end of the air line) then push the air line into the fitting as far as possible. That's all there is to it. After installing your air helper spring kit make sure you have at least 1/2" of clearance around the entire air spring. A good rule of thumb is to use the thickness of your hand and feel around the entire air spring if you hand comes in contact with an object on the vehicle you may have a problem. If the object can be moved relocate it if it cannot contact Firestone for further assistance. I used 5mm steel plate for the top and bottom plates although you could use 6mm plate or buy universal plates from airbag suppliers already drilled. They would still need mounting arrangements fitted though, as there are no plates commercially available which directly suit the Oka. Fit the air pipe and connect up the air supply and controls. It sounds easy but the devil is, as always, in the detail. The bottom plate is probably the easiest to start with. Assuming the U-bolts and spring centre bolt don't protrude above the level of the spring clamp (if they do they will need to be cut off or clearance holes cut in the plate), the plate can be designed to rest on the centre of the spring clamp with supporting out-riggers welded on which rest on the wings of the spring clamp. 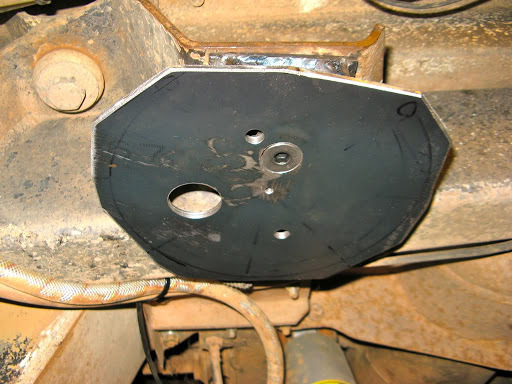 The plate can be held on by bolts (high tensile to survive vibration stress) down though the wings of the spring clamp (the bolts need to be positioned carefully so their heads don't foul the outer edge of the airbag piston) or up though the wings of the spring clamp into tapped holes on the bottom plate (be careful of the depth). For bolts hidden under the piston, assuming they don't foul the insides of the piston, their heads could be welded on to the bottom plate. Rear airbag bottom plate, viewed from underneath. The horizontal bars rest on the spring clamp wings. Other fixing methods could also be devised by attaching brackets to the spring clamp. The Firestone suggestion of using clamps around the spring pack is not desirable as it can bring unfortunate results. Clamps around the spring pack can slip. This photo of NT001 is from the "Suzi and Rudi on Tour" website. The airbag was apparently undamaged but the mounting arrangements had to be redesigned. Note that access to the U-bolt nuts will probably not be possible after fitting the airbags (although you might be able to provide access holes though the plates for some, but not all of them), so ensure they are fully tightened before doing any design or assembly so things can't move. Subsequent checking of U-bolt torque will necessitate jacking up the chassis, releasing the air pressure, unbolting of the bottom plates and raising the airbags out of the way to provide access to the nuts. The airbags don't have to be removed completely. The top plate needs to be mounted to the bump stop bracket via a 25mm spacer so that it clears the bottom of the chassis rail. A long countersunk bolt can be used for this and I chose to weld its head on to the plate since it won't be accessible once the airbag is bolted on, but that's not essential. Alternatively, a bolt could be inserted downwards through the bump stop mounting bracket into a tapped hole in the top plate (be careful of its depth). Holes will be needed to attach the airbag to the plate and will have to be arranged so that the air inlet connection is accessible. One hole will probably go through the bump stop bracket, which is a good thing as it prevents the plate rotating in service. For the 25 mm spacer, I welded a steel box to the top of the plate. A couple of thick steel blocks would do but are heavy, like the cylindrical block removed from above the bump stop rubber. I have seen photos of round cylinders or square tube used for this purpose (see below), which might simplify the design, but I preferred a more substantial arrangement. I probably went overboard by welding strengthening ribs to the top of plate as well but this can cause the plate to warp. Rear airbag top plate trial fit. The square spacer block is needed to clear the chassis rail and the round spacer is because the bolt was too long. Alignment of the top and bottom plates can be problematic. The location of the airbag is governed mostly by the position of the top fixing holes which are in turn constrained by the chassis rail and bump stop bracket, but it should be inboard rather than outboard to maintain adequate clearance from the tyre. Using cardboard templates, the approximate centre point of the top of the airbag can be determined. With the spring/chassis spacing at the normal distance of around 260mm, drop an approximate vertical from the centre of the top plate to the spring clamp. This will determine the centre fixing hole for the piston but a misalignment of 1 or 2 cm won't affect airbag operation, after all, springs are flexible items and move around and expand and contract all the time when driving. The centre fixing bolt should be as close as practical to the longitudinal centre of the spring clamp (I don't like the idea of mounting the airbag to the spring itself) but is unlikely to be central laterally (due to the fixing hole problems) and doesn't need to be. My rule of thumb is that the centre of the airbag should be no further inboard than the edge of the spring. If the airbag is outboard there is a risk of it being abraded by a tyre at full axle articulation. These are slightly more challenging than the rear due to the proximity of engine components, shock absorbers and steering movement of the tyre. Also, on the drivers side, the stud fixings from the spring clamp to the diff housing get in the way. As for the rear, if the U-bolts or spring centre bolts protrude above the top of the spring clamp they will need to be cut off and/or clearance holes cut on the bottom plates. However this can't be done for the 2 studs into the diff housing. The thread length could be shortened, or the studs replaced by bolts, but they will still protrude above the level of the spring clamp. Fortunately, the hollow area inside the airbag piston allows it to be located over the studs with adequate clearance, and that will dictate the location of the airbag on the drivers side. When cutting clearance holes in the bottom plate for the studs and nuts, note that the stud spacing is different to the U-bolt spacing. Apart from that, the bottom plate design can be similar to the rear airbags, except that mounting arrangements will necessitate brackets being welded or bolted on to the spring clamps to allow the plate to be attached. Drivers side airbag. The diff studs fit under the piston and brackets were welded on to the spring clamps to allow fixing of the bottom plate. At the front, the top plates are actually a bit easier than the rears, since the bump stop brackets are lower than the chassis rail so no spacer is required. However, the location of the airbag fixing holes and air inlet connection will still require the same degree of design experimentation. The tapped bump stop M12 slug can be used to hold the top plate on via a countersunk bolt but I also welded a bracket on top of the top plate and used a bolt though the inner side of the bump stop bracket for additional stability. This also prevents the plate from rotating in service. 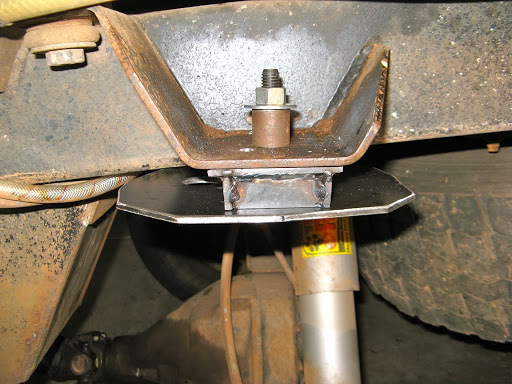 Support plates could also be welded to the chassis or bump stop bracket if desired. Note, the 2 bump stop brackets are slightly different in design, the drivers side bracket is wider. (I suspect this was due to the bump stop having to be moved outwards to clear the diff studs). 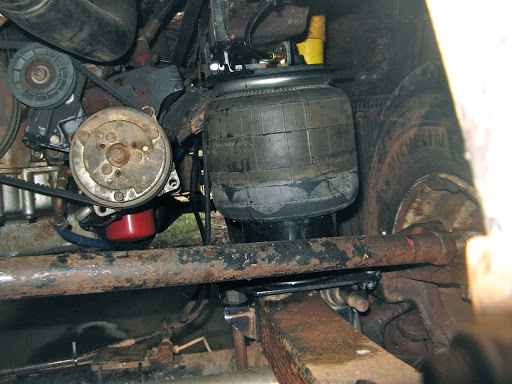 In my case, on the LHS, I have an air compressor mounted on the engine mount so I had to ensure that it could not come into contact with the airbag. So the LHS airbag is more outboard than the RHS, but still will not come close to the tyre. Once the mechanical manufacture and fitting is done (which took over a week of full time work for each of the rear and front systems), the air system can be connected. Obviously a permanent source of air pressure is required but airbags don't require a huge volume of air like tyres do, only pressure up to 100 psi (although in reality 60-70 psi is more than adequate), so an electric compressor would be satisfactory. For maximum flexibility, individual air controls are preferable but the front and rear pairs (or indeed the left and right pairs) could be commoned up but you would loose the ability for selective levelling. 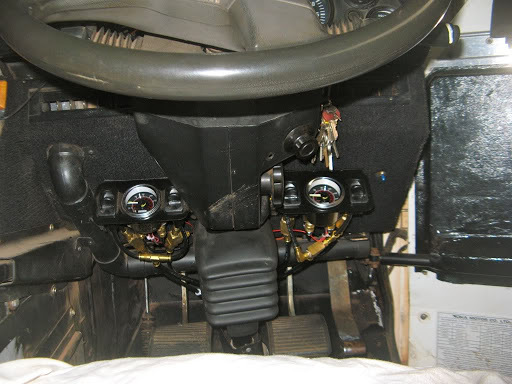 Since I fitted airbags in 2 stages, I bought 2 dual control panels at different times which I mounted either side of the steering column and that works out quite well. However a quad controller is also available but would require more space to fit. Running the air pipes to the individual airbags around the chassis, plus one to the compressor, is a bit of a pain. They must be fixed (with tie-wraps) so that they are protected from wear and impact (ie above or behind chassis rails like brake pipes), as the sudden deflation of an airbag could cause handling problems. I fitted a check valve and tap to the airbag air supply so that the airbag system can be isolated from my main air system and be protected from any compressor failure or maintenance activities. I didn't want sudden suspension changes to occur while working on the compressor system, although this is highly unlikely since the control panel switches prevent release of air from the airbags. 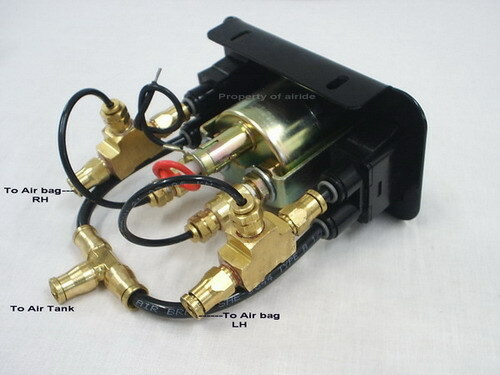 A small air tank could also be fitted as a reservoir to maintain the airbag supply. I leak tested all the joints with soapy water and once fitted, the quick push-fit connectors have never leaked. The control system works well although manipulating 4 controls is a bit of a handful. I connected the rear left and right airbags to the LHS control panel and the front left and right airbags to the RHS control panel. 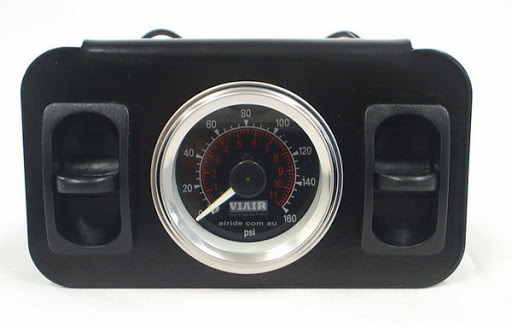 The gauges have dual needles, one white and one yellow. I connected them so that "White is Right" so I can remember which is which. 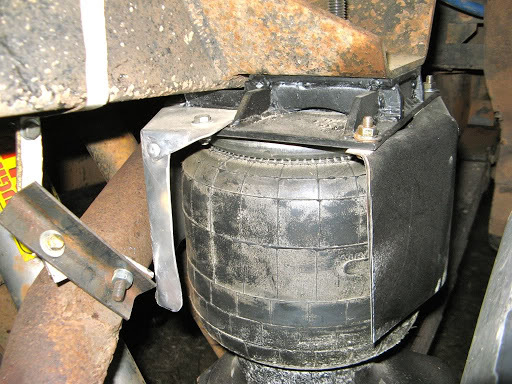 When fitting the rear airbags I was initially concerned whether the tyres could ever impact the airbags at maximum axle articulation so I fitted some protective plates, partly to tell if there were any wear points and also to protect the airbag if there was. After the Cape York trip there had been no contact at all so the plates are now redundant. But I did have to re-route the exhaust system so that it was well away from the airbag and fitted a heat deflector plate as well. If an airbag does get punctured (rather than worn away though abrasion), it might be fixable temporarily using a tyre plug. Fitting airbags has been a long but interesting task. The rear airbags worked well over 14,000 km but I have yet to test the front airbags over any rough tracks. A question still remains over whether stronger or softer shock absorbers work best with airbags and I'll be testing both types on the next trip. I'm hoping that my calculations and assumptions are correct and that we'll get some significant ride benefit from them, plus improved suspension reliability, as well as overnight motorhome levelling. Great information thanks. Pity your photo bucket photos are no longer linked. Have you considered re-linking them with a new host? Yes Chris I am doing progressively that, but there's a huge amount of work involved. Photobucket is the cause, they suddenly imposed a $US400 charge for linking to stored photos, a very unethical business practice which will surely cost them a lot of customers, like me.